Tokunation › TokuNation › Contests and Giveaways › Toku Toy Box 2017 Announcement! Toku Toy Box 2017 Announcement! Once again we’ve come upon the time of year we love most – time for the members and staff of TokuNation.com to celebrate their respective holidays with their friends and loved ones. But it’s also time for TokuNation to celebrate itself. Our little community has hit another milestone this year, our 6 year anniversary!! January 4th 2018, will officially mark 6 years since TokuNation first went public as part of the network of TFW2005.COM, ToyArk.com, and HissTank.com through both network owner Tony_Bacala and TokuChris. For 6 years now we’ve posted news, rumors, toy galleries, videos, and even dabbled in podcasts for a bit (never forget Talkin Toku!). As times have changed we have tried to change with them, delivering you content in different ways, updating our photography to take better galleries, and expanded in to new areas (check out our official YouTube channel, full launch coming in 2018!). 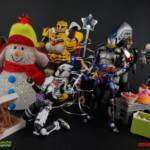 But there’s one thing that we don’t want to change – our annual Toku Toy Box giveaway! Like years past TokuNation is hosting an annual holiday giveaway open to ALL registered users! You’ll recall that in years’ past giveaways, users could post in a selection of galleries within the contest period to automatically be entered into the drawing for 1 of 4 prize packs. This year however we’ve opened things up. Not only will we be posting a number of eligible galleries throughout the month of December, but every gallery we’ve posted in 2017 also makes you eligible! If you’ve already posted in the 1 of the 40 galleries we’ve produced this year, then you’re already entered. If not, you already have 40 chances with more on the way this month! To show our appreciation to you, the community, we’ve assembled 4 incredible prize packs spanning Power Rangers, Super Sentai, Kamen Rider, Ultraman, and more! Click “Discuss on the TokuNation Forums” at the bottom of this post to be taken to the OFFICIAL RULES for of Toku Toy Box 2017! Remember – we’re keeping the prizes an absolute top secret for now so keep an eye on our frontpage and be sure to subscribe to the official TokuNation YouTube Channel. Trust us, you are going to LOVE what we have in store for you this year! For now though, thank you. Thanks to all of you who continue to call this place your home for news, discussion, images, sales, friendships, artwork, videos, podcasts, and everything else in between. Happy Holidays from all of us, and best of luck in our giveaway! It’s our gift to you this, and every, holiday season! Toku Toy Box 2017 Giveaway Official Details! TokuNation's annual giveaway Toku Toy Box returns for a triumphant 6th year! To celebrate the holidays this season and our 6 year anniversary we've assembled the latest and greatest in our series of annual giveaways! Read on to find out how to enter! Normally, throughout the month of December, we post toy galleries that qualify you for an entry in the giveaway, just by posting in them. HOWEVER, this year we've decided to do things a bit differently. For many of us, the holiday season can be a hectic rush and the last thing on your mind will be to visit a website for toys and TV shows to enter a contest. So in an effort to allow absolutely every user possible a chance to enter, we've opened things up a bit. Not only will we be posting a number of new galleries all throughout the month of December, but every gallery we posted in 2017 up til now will qualify you for entry! If you posted a reply in any of the 40 galleries that have gone live on TokuNation this year then you've already been entered. And if you haven't, you already have 40 opportunities for entry! With plenty more to come through out the month of December! For each gallery, you need only make one relevant (non-spam) post in that discussion thread to be entered into our giveaway! Additional posts in the same gallery will not give you additional entries. As stated we've already got 40 threads for you to use for entries from the last year alone, with many more going live over the course of the next month. Every time we post a new gallery you'll have yet another chance to be entered into our giveaway! Toku Toy Box is open ONLY to registered TokuNation.com users, but this contest is also open worldwide. We will ship these prize packs anywhere. You just need to register and post in any of the relevant upcoming photo galleries for a chance to win. Each time we post an eligible gallery we'll tag it so you know what to do. We'll post a link and an update in this thread every time we throw another gallery up! NOTE: All prizes within the Toku Toy Box are donated at the expense of the individuals listed in the first news story of the contest. Unless otherwise noted, no prizes have been donated from any company. Winners must be in good standing on the TokuNation forums. Any member with 3 or more active infractions is not eligible to partake. TokuNation staff, TokuNation former staff, and network current and veteran staff are not eligible to win. TokuNation.com has the right to refuse any entry in to Toku Toy Box. Winners selected at random in January 2018. IMPORTANT REMINDER: All forum rules are in effect. Click here to revisit our forum rules. Duplicate accounts on the forum are against the rules. Anyone found using a duplicate account to enter the contest will be permanently banned from the TokuNation.com forums, and disqualified from Toku Toy Box. SITE REQUEST: If you win one of the 4 prize packs - congratulations! If you happen to own an item in the prize pack that you win, we only ask that you please "pay it forward" ... instead of selling it, gift it to a friend, give it away, or do something of that nature. Keep the spirit of giving to each other alive! Wow. Did you hear that Matrixbeast? This might be your year! If you guys have any questions, please ask them here. Yay! I wonder what the gifts will be this year? So since I was a previous winner, am I eligible to enter this year or no? I don't see anything in the rules about it, but I don't want to cause any complications if I participate, so I thought I should ask. 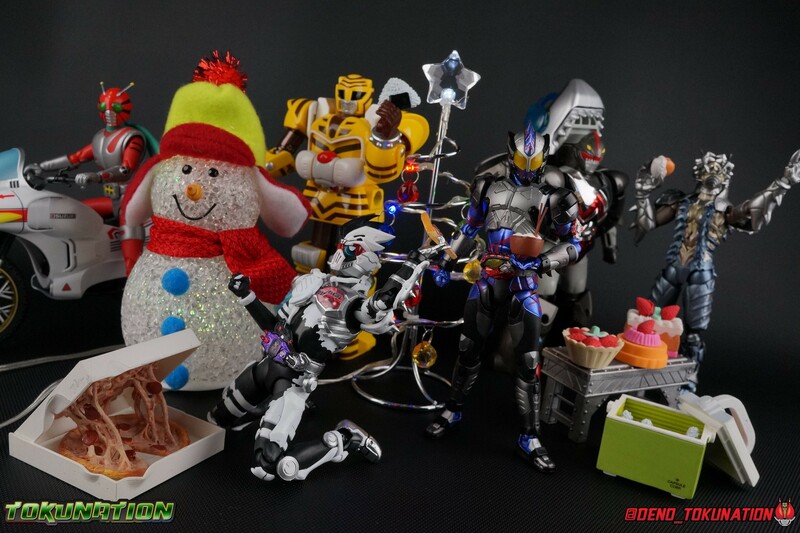 so is this what a tokunation christmas party is like? No, the contest is not open to previous winners like us. You may still post in the galleries, but they don’t count as entries.